The distribution of biotypes is changing rapidly (the monoecious biotype has spread south through Georgia, South Carolina, Tennessee, and Alabama). Populations north of South Carolina were often monoecious (having both male and female flowers on the same plant) (Cook and Lüönd 1982; Madeira et al. 2000). Fertile seed production was reported in the monoecious type (Langeland and Smith 1984). Both biotypes depend on tubers for overwintering, although monoecious hydrilla exhibits a more annual habit than the dioecious type, with abundant tuber/turion production around September (Owens et al. 2012). Native Range: Korea appears the likely origin for the monoecious type (Madeira et al. 1997). Table 1. States with nonindigenous occurrences, the earliest and latest observations in each state, and the tally and names of HUCs with observations†. Names and dates are hyperlinked to their relevant specimen records. 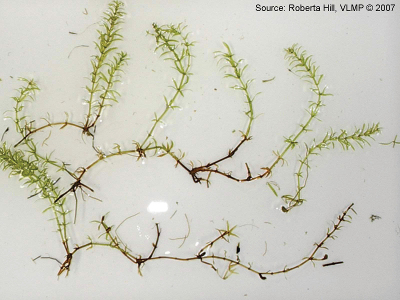 The list of references for all nonindigenous occurrences of Hydrilla verticillata [monoecious] are found here. Means of Introduction: The monoecious strain was a separate introduction, first found decades later in Delaware and the Potomac Basin (Environmental Laboratory 1985; Miller 1988; Madeira et al 2000). Status: Currently established in 18 states of the US (AL, CA, CT, DE, GA, IN, ME, MD, MA, NJ, NY, NC, OH, PA, SC, TN, VA, WV); occurrences in Washington, and Wisconsin were removed or controlled in isolated ponds (Herrera 2011; Asplund 2007). U.S. Army Corps of Engineers (USACE). 2003. Aquatic Plant Management Plan for U.S. Army Corps of Engineers, Savannah District. U.S. Army Corps of Engineers, Savannah, GA.